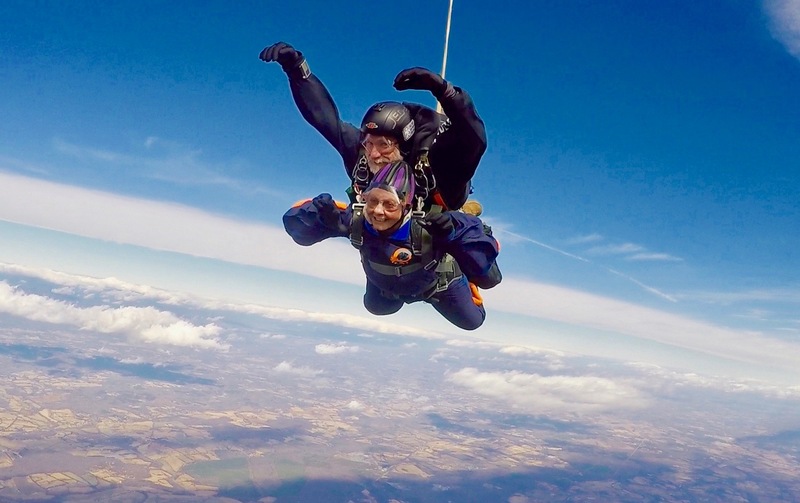 Reading a skydive review that ends with “MADE MY 75th BIRTHDAY ALL SO VERY SPECIAL!!! ” guarantees this person has an interesting story. 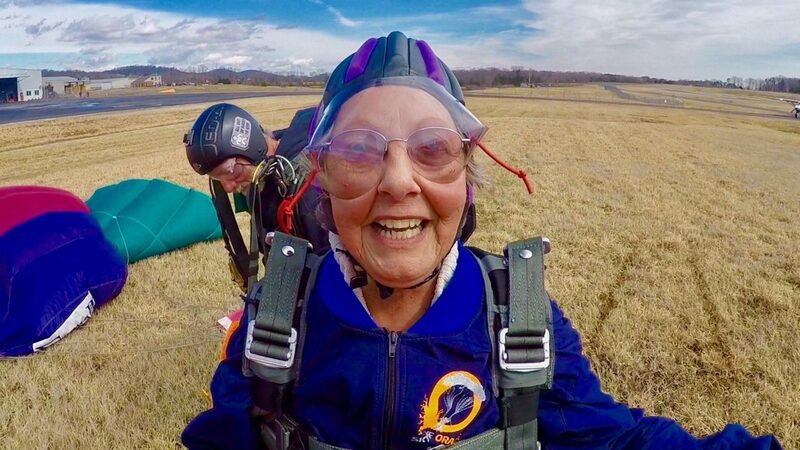 Curious minds want to know why her seventy-fifth trip around the sun called for a tandem skydive! Jenith Hodge was born in the tiny coal town of Imboden, Virginia. And yes, it is spelled J-e-n-i-t-h, named for a relative somewhere in the family tree. When the coal ran out her family moved to Big Stone Gap where she grew up and graduated high school. Her earliest memories were always about looking up. She loved the birds, the clouds, the moon, and the stars. You could say Jenith has always had her eyes on the sky. When speaking with Jenith about her life story she claims not to be all that adventurous. We would beg to differ. Jenith has been married for 56 years to her high school sweetheart Charlie. With his career in the Air Force, they were stationed in Virginia, Missouri, Homestead Florida and finally at Andrews Air Force Base. Charlie also served in Viet Nam. Jenith worked in the Postal Service for 23 years. She was a member of the National Christian Choir and traveled to Israel twice for singing tours. One of those trips to Isreal was for Easter Sunday in Jerusalem. The choir also toured Germany, Austria, Switzerland, and Czechoslovakia. She went to Haiti on a Mission trip at the end of 2017 ringing in the New Year 2018 on foreign soil. Somehow along the way, they stumbled onto a beautiful piece of property near Mineral, Virginia in 1979 and bought their little slice of heaven for eventual retirement. They finally built their house on that property in 1994 and continue to enjoy the view overlooking the lake and all of the wildlife the area has to offer. They are both active in their church and community and love entertaining with friends and family. It is clear when speaking with Jenith that her faith is a profound part of who she is. Life has not always been blue skies and fun. Like most of us, there have been difficulties and heartbreak. She and Charlie lost their oldest son to a car accident. They have managed the grief through faith and service to others. Giving back and having an open heart seems to go hand-in-hand with her outgoing spirit. With all the moving and traveling while raising two sons, the activity has never stopped. Jenith loves being on and in the water and especially loves sailing. She enjoys the peace and quiet, but also that feeling of flying over the water. For many years she bought season tickets to Kings Dominion, the roller coasters were a favorite spot to take her grandson in the summer. When she lived in Florida, she could see the sailplanes taking off to glide and often thought she would like to try that adventure someday. At the time she was busy raising children, and she could never justify the expense. 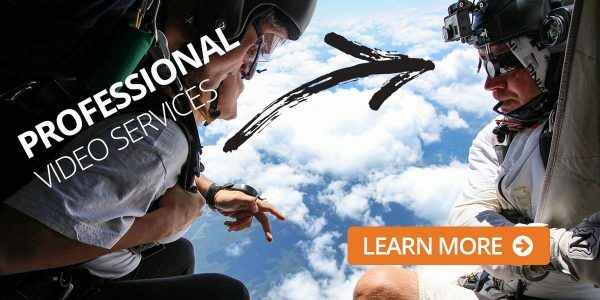 Finally, she started taking a look at how to celebrate turning 75, and it just seemed the perfect time to go skydiving. Jenith can’t find any adequate words to describe how thrilling the tandem experience was for her. Her joyful online review literally said, “THE WORDS HAVE NOT YET BEEN INVENTED TO DESCRIBE THE THRILL!! !” Her support team that day consisted of her husband, son, and grandson. 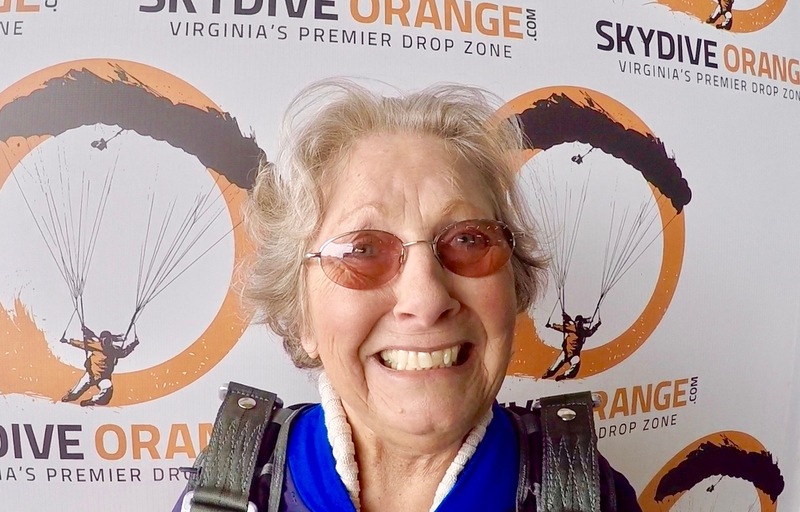 She was ready to load into the plane when she found out that her 19-year-old grandson had decided at the last minute that he would also jump the same day! He was able to ride up for her jump, and she later rode in the plane to watch him make his tandem. She remembers when her grandson was little, and they were lining up to ride a big roller coaster she would always put on an act and exclaim “Oh Lord, I’m gonna die!” and he would reply back with a reassuring “Memaw, you’re not gonna die!” How wonderful that all these years later Memaw is still leading the way but this time for sky-high adventure! When reminiscing about her tandem jump, Jenith says she had no fear but lots of anticipation about jumping out of a plane. She remembers that she was smiling from beginning to end! The view was astounding from above and surpassed what she had imagined. She has nothing but praise for her tandem instructor Jim and her videographer Gene. When asked if she has watched her video she admitted to being a repeat offender and has only watched it every single time she has used the computer since her skydive on Feb 18th! With her computer situated on the third floor it is no small task to climb those three flights, but each time she checks her email she plays the video, and it is like reliving the thrill. In her opinion, she can’t imagine why anyone would decide not to get the photo and video package! Having all those photos and the video has been worth every penny. Of course, we all want to know if Jenith wants to skydive again. While in the line getting ready to load onto the plane someone asked that very question. Since she was being filmed there was a blurted automatic reply “Maybe for my 80th,” and as soon as the words were out of her mouth, she knew she was not going to wait five more years. Jenith Hodge wants you to know she can’t wait to be back in the sky! She is saving up her funds for another tandem as soon as possible. She pointed out that Skydive Orange is right up the road and summer is right around the corner! We wish you nothing but Blue Skies, Jenith! Whitney Payne on Skydiving Overweight is possible at Skydive Orange! 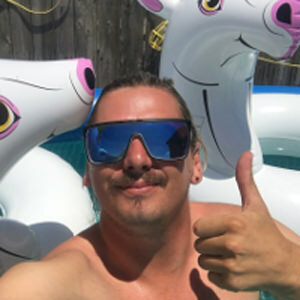 Jacob Campbell on Skydiving Overweight is possible at Skydive Orange! I want to fly! on Skydiving Overweight is possible at Skydive Orange! The instructors in the AFF program are on par with any top-tier coaches in any sports discipline. They do very well at breaking down and teaching skill-sets and instilling the confidence needed to execute a dive successfully. The largest tandem skydiving center near Northern Virginia, Washington D.C. and Maryland. Skydive Orange is a member of the United States Parachute Association. Copyright © 2019, Skydive Orange, All Rights Reserved.